You explain a concept to a client. You meet two weeks later to follow-up only to find that you've got to explain the concept over again. What happened? Did you do a lousy job of explaining? Or is the fault with the client's learning abilities? Maybe one, both or neither. We forget easily. Image too small and grainy? See the high quality full size graphic. You can save to your computer and use it in PowerPoint. 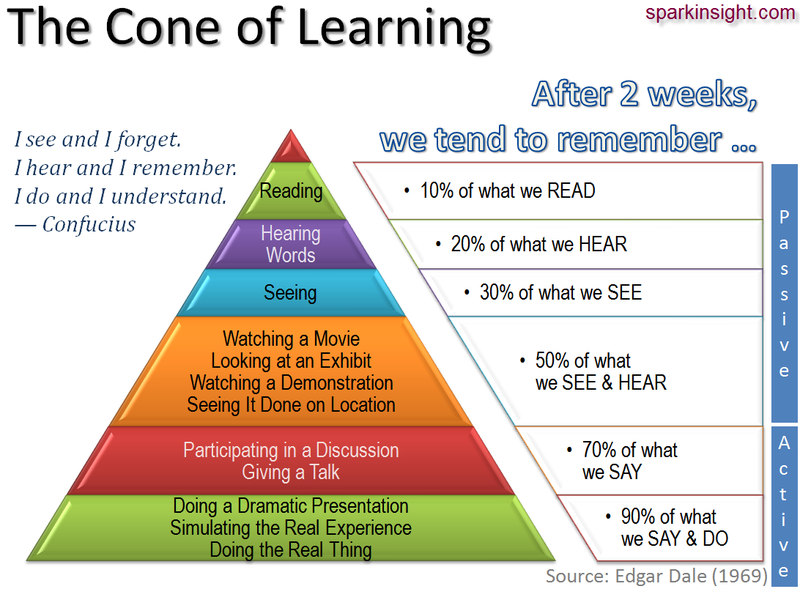 The Cone of Learning, developed by Edgar Dale in 1946 helps us understand what happens. After two weeks, we remember only 10% of what we read (bad news for a blogger) but 90% of what we do. To improve recall, we need to engage our clients in more ways. What do you suggest?